Ranchi is the main and capital city of Indian state of Jharkhand, the state is very well connected with Air, Train, and Roadways. Although Ranchi is growing very fast with fast time but still medical facility of this city is not enough to deal with severe and critical medical emergencies that are why still maximum emergency patients are being transferred to Delhi, Chennai, Vellore, Mumbai and Bangalore from Ranchi. In need people looking for quick and medically packed charter Air Ambulance from Ranchi to Delhi, Ranchi to Chennai, Mumbai and for other cities. In fact, there is huge need and demand for charter Air Ambulance Service in Ranchi. To fulfill such a medical emergency and to provide patient transportation facility Decan Air Ambulance Services team are now available in Ranchi with full fledge. So if you ever look for an emergency Air Ambulance Service in Ranchi with comprehensive medical facility along with bed to bed transfer services then feel free to contact with Decan Air Ambulance services. 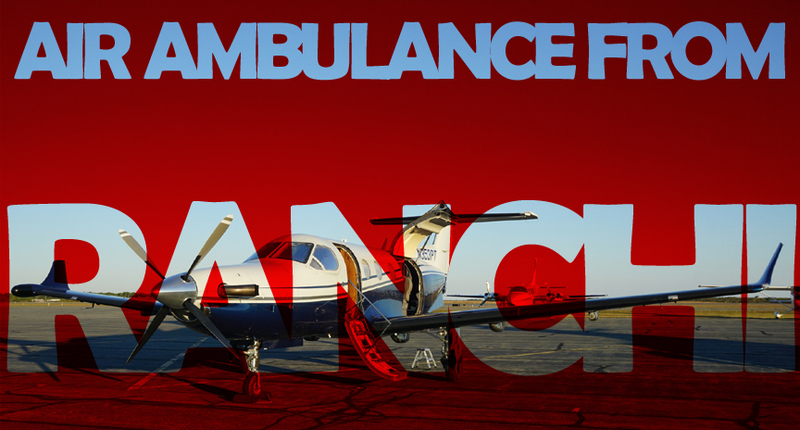 The compassionate medical transport services of Decan Air Ambulance will make you very easy and enable to safely, comfortably and quickly shift your patients anywhere within the country with proper care and medical support. On the other hand, Air Ambulance from Ranchi Cost by Decan Air Ambulance is also very low then another charter Air Ambulance in Ranchi, another best thing is that Decan Air Ambulance provides both domestic and charter Air Ambulance from Ranchi with same services and medical facilities at a reasonable fare. So must contact once if you ever need Air Ambulance Services in Ranchi to shift your loved one from Ranchi to anywhere within the country. Decan Air Ambulance in Ranchi with the team will be always available and ready to fly 24/7 to shift your patient within golden hours. In fact, we provide 24 hours online tech support team to response your call and confirm your booking within a short span of time. Therefore must avail our lifesaving medical transport services to safely transfer your patient from Ranchi to Delhi, Chennai and anywhere within India. Now you all can also avail the advantage of Decan Air Ambulance from Jamshedpur with compassionate services and bed to bed transfer facility at an affordable fare.